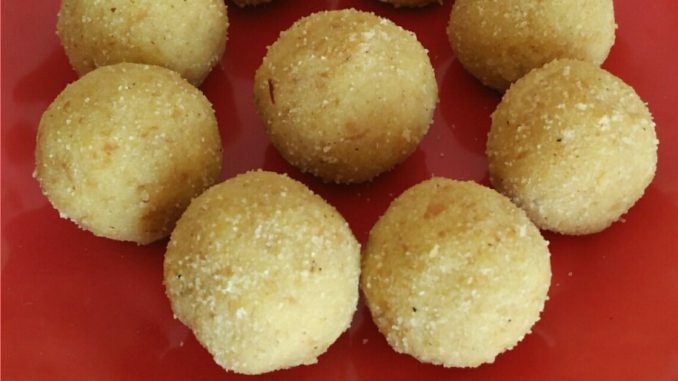 This is one more recipe from Konkan where we add fresh scraped coconut to Rava Laddus. It tastes delicious. 1. Roast barik rava with pure ghee, on medium flame. 2. After 10 minutes, add scraped coconut. roast till light brown. 3. Soak saffron in a spoonful of water. 4. In a thick bottom pan add sugar and ¾ cup water. 5. Make a syrup (chasni) of it. boil it till it reaches to one string consistency (in marathi we say “ek taari paak”). Keep stirring all the time. 7. Turn off the flame. 8. Slowly add the roasted rava and mix well. add cardamom powder and mix well. 9. Keep stirring for about 10 minutes. 10. Let it cool; stir every 5 minutes. Mixture will start to thicken. 11. 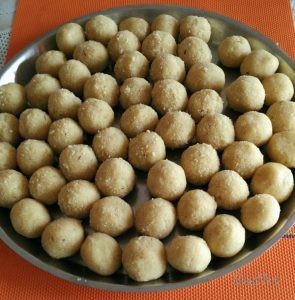 While mixture is warm and dry enough to roll laddus, make lemon size laddus. 1. The most important step in this recipe is to make right consistency syrup. If Syrup is overcooked, you will not be able to roll laddus. So be watchful. 2. These laddus will last for 3-4 days without refrigeration. If you want to keep them longer, then keep in a closed container and store in refrigerator. Before eating, you can microwave it for 10 seconds. Or take laddus out from refrigerator 1 hour before you want to eat them. Then no need to microwave them. This is the terminology used to indicate the thickness of Sugar Syrup (Paak). Mix Sugar with water and start boiling the mixture. It is necessary to keep stirring the mixture continuously. When the mixture starts boiling, you can stir the mixture after every couple of minutes. After boiling it for a few minutes when it starts getting sticky, you should start checking the consistency of syrup. Take a drop of syrup on the index finger. Using thumb and the index finger pull the drop. Because the mixture is sticky, threads will form. If you see a single thread, it is Ek Taari Paak (Single Thread Syrup). If you don’t see any threads, cook the mixture further. If you cook the mixture after Ek Taari Paak you will get Don Taari Paak (Two String Syrup) when you see 2 threads. You can continue cooking to get thicker sugar syrup this way. Remember to turn the gas to low flame while you check syrup consistency. Also keep a bowl of water ready so that you can dip and clean your fingers after checking the syrup every time. रव्याच्या लाडवांची ही कोकणातली लोकप्रिय रेसिपी आहे. ह्यात रव्याबरोबर ओला नारळ घातला जातो. अतिशय स्वादिष्ट लागतात हे लाडू. १. एका कढईत तूप आणि रवा घालून माध्यम आचेवर भाजा. सारखं ढवळत राहा. २. १० मिनिटांनी खवलेला नारळ घाला आणि परत ढवळून भाजत राहा . ३. रवा गुलाबी रंगावर भाजला की गॅस बंद करा. ४. केशर चमचाभर पाण्यात भिजवा. ५. एका जाड बुडाच्या पातेल्यात साखर आणि पाऊण कप पाणी घ्या. गॅसवर ठेवून सारखं ढवळत राहा. एक तारी पाक करा. ५. 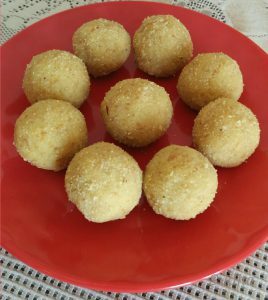 केशर घाला. मिक्स करून गॅस बंद करा. ६. आता भाजलेला रवा हळू हळू पाकात घाला आणि ढवळून मिश्रण एकजीव करा. गुठळी होऊ देऊ नका. ७. वेलची पूड घालून मिक्स करा. ८. १० मिनिटं मिश्रण ढवळत राहा. ९. आता मिश्रण गार करायला ठेवा. ५–५ मिनिटांनी एकदा ढवळा. मिश्रण हळू हळू सुकायला लागेल. १०. मिश्रण कोमट झाल्यावर लाडू वळता येतील तितपत घट्ट झाल्यावर मध्यम आकाराचे लाडू वळा. १. ह्या रेसिपीत साखरेचा व्यवस्थित पाक बनवणं हे खूप महत्त्वाचं आहे. पाक जास्त झाला तर लाडू वळता येणार नाहीत. म्हणून पाक बनवताना लक्ष ठेवा. २. हे लाडू फ्रिज मध्ये न ठेवता ३–४ दिवस राहतात. जास्त दिवस ठेवायचे असतील तर फ्रिज मध्ये ठेवा. खायला देताना फ्रिजमधून काढून मायक्रोवेव्ह मध्ये १० सेकंड गरम करून द्या किंवा खायच्या १ तास आधी फ्रिज मधून लाडू बाहेर काढून ठेवा. Please share how to make the sugar syrup of the precise consistency. Process of making Sugar Syrup has been added in the Notes of this recipe. Please check.